This just goes to show that you really can learn something new everyday! Today I learned how to tell an iPhone 3G and an iPhone 3GS apart without having to look at software, hardware rev numbers or any thing else. All you have to do is to take a look at the back of the iPhone. 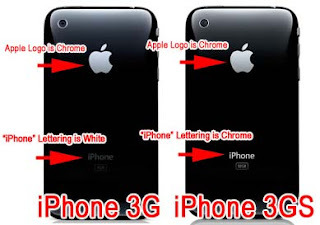 If the lettering of the word "iPhone" is in chrome like the Apple logo above it, then you are looking at an iPhone 3GS. Thanks to the good folks at DirectFix.com for point this out. You can read their blog post on the subject here. By the way, I'm still looking to buy someones iPhone 3G or 3GS as long as it is still in good working condition.